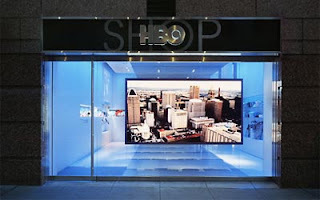 This stunning HBO Shop is located in New York and designed by Gensler. 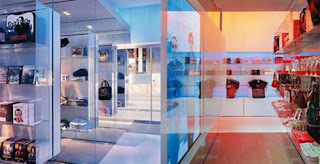 This shop is imaginatively designed and dominated with glass facade. The most unique thing about the interior design is the lighting that washes the space in an ever-changing variety of hues that are color coordinated to each show spotlighted. The effect of the lighting is so bold, when the pink lights is on the HBO Shop become chic and modern, when the blue lights is on the shop spreading new impression as a cool contemporary shop. 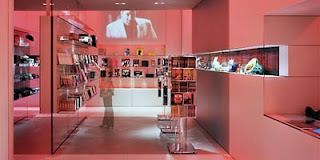 This HBO Shop design was named the 2007 Store of the year in the 36th annual Institute of Store Planner (ISM). Gensler work reflects a commitment to sustainability and their project shows that design is one of the most powerful strategic tools for securing lasting competitive advantage. HBO store is definitely a bold and unique brand experience. The lighting is ingenious! Excellent use of light to evoke a certain mood or feel depending on the show that is featured. I wish I could visit the store!